Quite a bit has been happening on the work side from here, and because I always feel like so many of you travel with me, I want to share the latest events with “the team”. At the end of October I traveled (solo) to Australia. It had been well over 7 years since I was last in Australia; too long. It was a very fruitful time of reconnecting with friends, churches, and of course family. While I have seen most of my family at some time over the years, there were a few I hadn’t. It was so needed, and so special to connect again. I spent several days in Sydney with my mum and sister and friends, then a few days further south with my brother and his family and other friends. From there I flew up to Brisbane for several days with another brother (the one I haven’t seen since 2010). He had moved there since I had last been Down Under. It was such a great time of relaxing, some sight-seeing, family time, and fun. Not to mention stocking up on Aussie items unavailable in Montana! Only the essentials, like Vegemite. After my return to Montana early November I immediately re-entered into discipleship teaching, speaking in the DTS here in Montana on the “Fear of the Lord”. This was a really great week with a very impressive school. These students were so willing to learn; responding so admirably to some very “loving yet challenging” truth about discipleship, our response to God and our ongoing relationship with Him. It can be challenging at times, but also so rewarding and enjoyable. Finally, early December I flew out to another DTS, this one is Maui. More of a last-minute invitation, they asked me to come in their final lecture week (of 12) before they head into outreach in Asia. Again, I was struck by their commitment, focus and passion in their final week of class. This is usually a time of distraction and tiredness as they prepare to head out on an unimaginable and exciting cross-cultural experience. But I was amazed at their determination to get every second out of every class. Back in Montana, and the cold, I’m home and moving into Christmas! (see some more pics below). Merry Christmas!!! 7 days in Cambodia, 100+ degree temperature, and 160 people. It was definitely the hottest weather I have experienced in Cambodia. We are sitting in Seoul airport right now waiting for our evening flt back to the States. My son Samuel and I have been in Cambodia for the “ASEAN DTS” – a collaboration of 10 Discipleship Training Schools from nations all over Sth East Asia, focused on reaching the ASEAN nations: about 160 people (for a description of “ASEAN” see our previous blog). DTS’s came from Singapore, Thailand (3), Cambodia (2), Vietnam (2), Myanmar, and Kona. I was invited to spend focused time coaching and training the leaders. While I did do a couple of teachings sessions during the week, I was mostly meeting with people, (and teams) in the afternoons, breakfasts, dinners, lunches, and in-between; I loved being used. You can’t come here and not be impacted. I learn and gain so much from being with so many committed people in the region. Our lives – by comparison – seem so easy. Being with these 160 people was amazing. We had times of HUGE giving to each other for unpaid outreach finances, personal gifts, and encouragement. There were also application times of good-old crying out to God for more heart for people, evangelism passion, repentance, praying for each other, and sending people with pioneering vision for the missions. Definitely a highlight for me, my son Samuel came along. He loves Cambodia and always wants to join me when I go. SO many people know our family and for them to see Samuel again was fun for them too. Samuel did great. He came to classes, suffered the heat (! ), stayed up late, hung out with people, and helped take care of some kids a couple of mornings. He did great with the food too. Everyone thought he was wonderful, and I loved having him travel with me. Really good times together. A very special thank you to those who gave to YWAM to send Samuel on this trip. It was worth it. Thank you. Sam with Borith, our Khmer friend from 2012. Long term friends and co-workers: Yuka and Deem. Crying out to God for more passion to evangelize the precious lost. Sam praying with/for people going into the region. In the late 70’s the Khmer Rouge regime implemented a widespread genocide across Cambodia in an attempt to create the perfect agricultural working class. Millions were killed. By 1995 – after ongoing conflict, government crises, internal corruption, and a somewhat lingering Khmer Rouge – the nation was being rebuilt. YWAM was right in the middle of it. My brother Andrew traveled to Cambodia as part of a YWAM outreach combining his aquaculture school (building a fish farm), and a construction school (building basic huts and homes). Together they built a new village for widows and orphans created by the country’s recent genocide and ensuing civil war. They were granted use of an island in the Mekong river, just outside of the capital Phnom Penh. This island was considered ideal because it was un-mined, as it had been a former execution camp for the Khmer Rouge. Andrew’s team, with the assistance of scores of widows, children, cripples, and war casualties, dug massive ponds and created a fish farm. Mass graves were unearthed, but a small village of new life was created. That was early 1995. 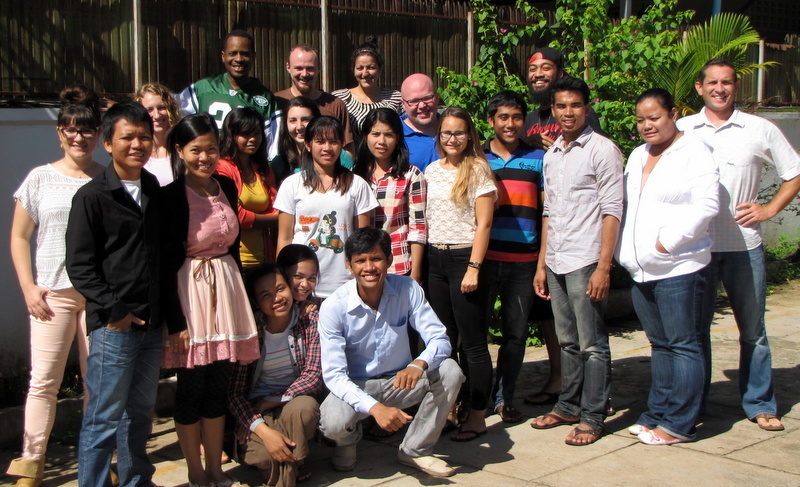 In December I was in Cambodia conducting staff and leadership training at YWAM’s Battambang campus. Living with the staff and students there, I asked a young guy one morning, “Where are you from? How did you get involved in YWAM?” I was dumbfounded by the answer. “Actually, I was living on a small island near Phnom Penh, which we call the “YWAM village”. My mother was divorced in the early 90’s and had nowhere to go and no way to take care of us. We were taken into the village by YWAMers. I became a Christian there, and wanted to serve God. When I got older I left there and joined YWAM in Phnom Penh, Then eventually coming here to Battambang.” This young man, Dara, is now married, has a child on the way, and is a respected DTS leader and missionary. He has traveled to China and back 4 times, led and discipled multiple students, and is in the process of reversing the dysfunctional family system he grew up in. Could this be the same village? I quickly asked some questions, and to my added surprise discovered that there were others in our location who came from that village and are now working in full time ministry in YWAM and the surrounding nations; including the leader I was closely working with that week. We were able to gather the other island-village guys and captured a quick photo. When I came into YWAM in 1995 it was directly on the heels of Andrew’s project in Cambodia. A few years later I started sending teams and going there. Today I regularly go there and scores and scores of fruit has come out of that country – and is growing phenomenally. What was a bold venture to build a resettlement village for the outcast, provided with an ongoing food source, has been bearing lasting fruit for years: in the families who were on the island, in my life, in those I led, and and the nation of Cambodia (and beyond!). Last December’s trip was probably one of my greatest rewards in ministry. First for my brother Andrew. He had confided in me that he had sometimes wondered what had happened through his work. Anything? “100 fold”, at least! For myself, Andrew essentially introduced me to the nation of Cambodia. Several years after that it became a true focus of my (and my program’s) ministry. When I catch a glimpse of fruit from my own work, I sometimes (gratefully) stagger. But on this last trip, I saw what came from a small group of guys in early 1995. My work has come from their work. We often dream about the time when the fruit of our labor produces recognizable fruit. Unfortunately, it can sometimes feel absent, or at the best, unclear. But it is there! Seeds that are sewn in righteousness do bear fruit. As an encouragement to many out there, stay “mission-true”. Whether in family, friendships, ministry, or work, it will happen! It took 21 years for a massive revelation of a tiny team’s work. But the wait just made it sweeter, and time for more fruit to grow. This has been long enough. But if you want just a little more info about the guys in the photo, read below (I highly recommend it). He grew up on the YWAM island village on the Mekong. Now co-Leading a Battambang DTS, which is part of the huge ASEAN DTS. A wonderful guy with loads of potential and a very hopeful future in discipleship and leadership. His goal for the next year is to “be grateful, be generous, and lead well”. Leadership eyes are on him to be a key leader within his generation. His mother was divorced, poor, and had nowhere to go. She took Dara to the island village (“YWAM village”) when he was very young and raised him there. He became a Christian and entered YWAM. Now a successful DTS school leader, married and child on the way. A dynamic leader and couple, missionaries to their generation and the nations around them (led teams to China 4 times now); an influential young guy. His story is one of complete family-system redemption, and of a person now in missions according to their calling. Raising their generation in the nation. Very poor background, living in the remote jungles of Cambodia. Taken into the YWAM island village when very young. Now a DTS Leader and pioneer in Stung Trang province, where he came from: a very difficult, very remote place. There, he worked among a small unreached people group in the jungle. This tribal people group consists of 6 small villages; these villages are known for their animal sacrifices, raising their animals simply to sacrifice them, often to various gods and spirits. Over the last two years they have seen a huge revival: four villages simultaneously came to the Lord! Then out of the remaining two tribes, 1 and a half of them have also just turned to Jesus. The rest gave up their sacrificing habits. The DTS has taken some of the tribal converts into the DTS. On their own DTS outreach they went back out to the tribes in the jungle. The students were very poor, but because they knew how to live in the jungle, they would catch food to eat, eat plants, and the whole team was able to live with the tribes. The people became Christians but didn’t know how to express it properly. They want to be grateful for what they have. Sophat was preaching and teaching in a village about making offerings to God. Everyone walked away in silence; they returned later with lots of meat, food, and other items to give to God! They love to sacrifice and give. Making “offerings” is one way that they know to do it so they gladly did that. The tribes started offerings to god by bringing food for “god” and for the team! Introduced to Cambodia as a mission-field by Andrew before Jeremy’s DTS. A few years later, God speaks to Jeremy to start sending teams to this “overlooked” nation. Teams go, individuals go and stay, and entire DTS schools go. Thanks to those individuals who went, bases were planted (Battambang being one of them), ministries pioneered, disciples made, and the story is still being written in Cambodia today. There are numerous other stories from the village that was YWAM built on the Mekong island in the mid 90’s. So many converts, disciples and missionaries have come from there. This year is going so quickly. In the past month we have wrapped up the Montana DTS Equip leadership training school, the following week I was in Mexico conducting leadership training for a group of YWAM school leaders, trainers and staff (by the way, the Eastern European DTS Equip in Ukraine just finished their second school, too). The Mexico trip was special to me; it was the first time I was able to take one of my kids, Joel, along with me. Just him and me, it was a fun and special time. A week later we were back in Montana and preparing to move house. On August 23rd the Wests changed address! As many of you know it has been a busy, but exciting year as we built our new home. So many God-stories are to be told, all accumulating to make-up the blessing and miracle of our first new home! We are already using our guest room for hospitality, receiving family and friends the first weekend after we moved in. As our friends were arriving, I was off again—this time to Cambodia—from where I am writing now. 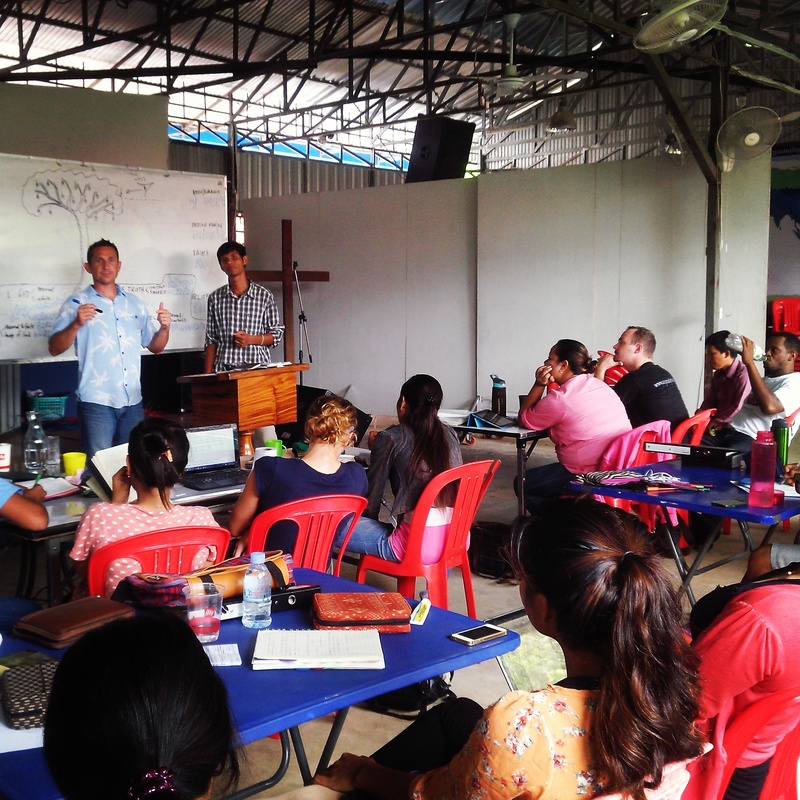 I am here helping to kick off the third South-East Asian DTS Equip, running in Battambang, Cambodia. This is first time we have not brought our whole family here for the two-month program. Our roots and our relationships here are deep, so not coming as a family is something of a disappointment for us. As hard as it is for our family in Cambodia at times, the kids still wanted to come! But our intention has always been to pioneer it, empower others, and hand it off. We have always wanted to develop regional leaders to facilitate this program who can take it to places we can’t. So it is an answer to prayer, but it’s also hard transferring something that you have worked so hard for to other leadership; even if you pick the leadership team! It has, in fact been a great joy. The leadership team we put together is diverse, complimentary and committed. This is an exciting time, but also a little tenuous. Please join with us in prayer to support these leaders who are attempting to take this school to the next level; they are already experiencing some obstacles, but I am confident of their abilities, faithfulness, and of course the Lord’s empowerment, both practical and spiritual. This school has 16 diverse participants, representing 7 nationalities (Costa Rica, New Zealand, Cambodia, USA, Canada, Sth Africa, Vietnam). Collectively they represent ministries in the Philippines, Thailand, USA, and Cambodia. Handing off the school was a step of faith. But now, with a house that was completed late, with rooms still full of boxes, the kids entering higher grades at school, and an overly packed year behind us, we see God’s wisdom. I will continue to oversee the DTS Equip programs internationally, teaching, training and supporting, but my direct leadership of each school is on a deliberate decrease as I develop and release others into that role. As always, we are so grateful for your partnership and support. You are sharing the work and you will also share in the inheritance. Thanks.